Preheat the oven to 400 degrees. Coat a baking dish with cooking spray. Add broccoli to the baking dish and coat with oil and season with salt and pepper. Toss to coat. Roast for 8-10 minutes. Remove baking dish from the oven, slide the broccoli over and place salmon filets in the baking dish. Season salmon with salt and pepper. In a small bowl, whisk together maple syrup and Dijon mustard. Pour about ¾ of the mixture evenly over the salmon filets. Roast salmon and broccoli for 8-10 minutes, depending on the thickness of the filets, just until salmon just barely flakes with the pressure of the back of a fork. Optional: Broil on low for 2 additional minutes to give the salmon a crispy top (Caution: Do not overcook the salmon. It’s overcooked when it’s dry and rubbery.) 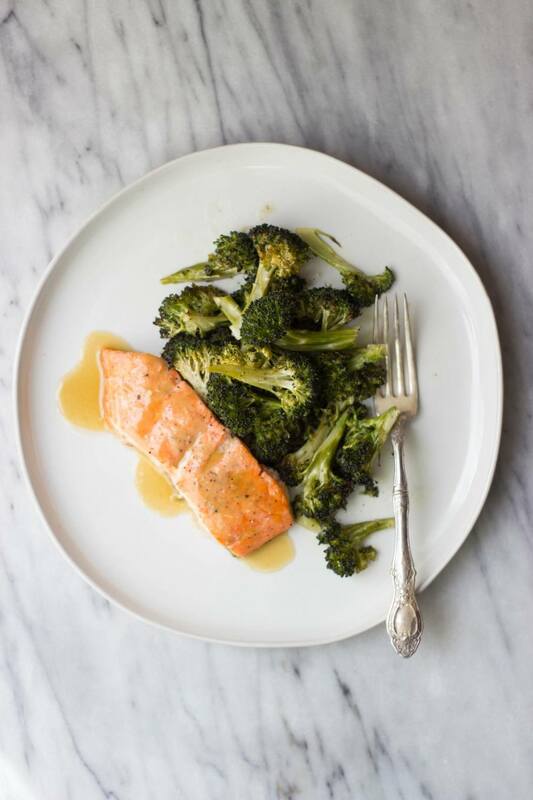 Serve salmon and broccoli with the remainder of the maple mustard sauce.